At the time Apple shares were moving sideways in a narrow range, just below the 38% Fibonacci retracement level of the 2018 high/low range. The piece suggested that the stock might be prepared to make a move higher. 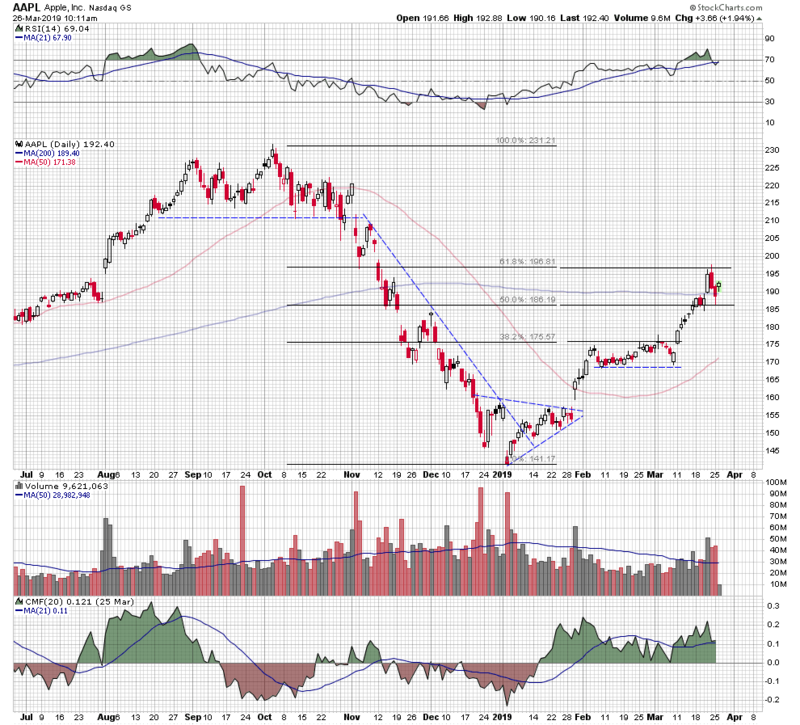 Over the next several weeks Apple rallied about 12% to test the 62% Fibonacci level before pulling back slightly. 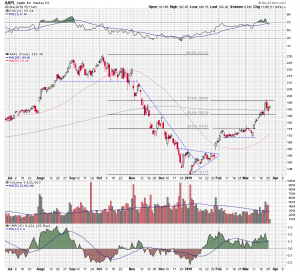 Now Apple sits just above its flat 200 day moving average and in between the 62% and 50% retracement levels. It could languish again as it had in February, moving sideways within the Fibonacci range, but we don’t think that will be the case. Yesterday’s Apple event, which included the introduction of the Apple Card and additions to Apple TV, was met with a modest level of enthusiasm by the market. This has got to be a disappointment to Apple bulls and with the stock price up over 20% this year, they may decide to cash out. Bottom line is that we think the path of least resistance will be to the downside. But, that is a guess. Ultimately, the integrity of 62% Fibonacci resistance or 50% Fibonacci support will likely tell the tale for Apple shares over the intermediate term.